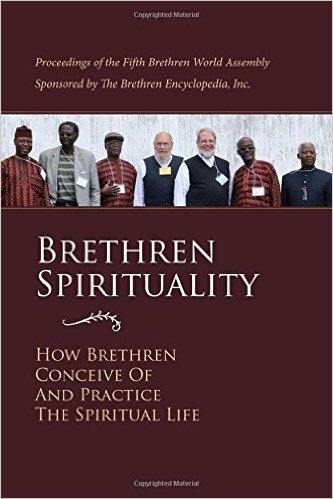 Brethren Spirituality: How Brethren Conceive of and Practice the Spiritual Life has just been released by Brethren Encyclopedia and is now available for purchase. The 270-page paperback book contains the papers and proceedings from the Fifth Brethren World Assembly which was held in Brookville, Ohio, at the Brethren Heritage Center July 11-14, 2013. The book contains scholarly papers presented by representatives of all seven Brethren groups descended from the German Anabaptist/Radical Pietist Alexander Mack, who founded the Brethren movement in Schwarzenau, Germany in 1708. A program chaired by Robert E. Alley, former moderator of the Church of the Brethren, included plenary presentations, panel discussions, tours of historic Brethren sites, and worship services during the three-day conclave. 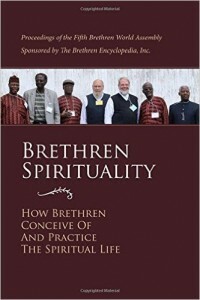 Chapters and authors under the “plenary session” section of the book include “Brethren Spirituality in the 18th Century” by Jeff Bach; “Brethren Spirituality in the 19th Century” by Dale Stoffer; “Brethren Spirituality in the 20th Century” by Bill Kostlevy; “The Place of Jesus in Brethren Spirituality” by Brian Moore; “Word and Spirit in Brethren Spirituality” by Brenda Colijn; “Community, Family, and Individual in Brethren Spirituality” by Jared Burkholder; and “Brethren Ordinances” by Denise Kettering Lane. Seminar chapters include “The Spiritual Writings of Alexander Mack, Jr.” by Aaron Jerviss; “Brethren Hymnody” by Peter Roussakis; “Separation from the World and Engagement with the World” by Carl Bowman; “Brethren Devotional Literature and Poetry” by Karen Garrett; and “Spiritual Formation Practices” by Christy Hill. Worship messages include “Prayer” by Roger Peugh; “Missions and Evangelism as Brethren Spirituality” by Fred Miller; “Brethren Spirituality for the Future” by Robert Alley; and the transcription of a youth panel organized and led by Michael Miller. In addition to chairman Robert Alley, who represented the Church of the Brethren, the planning committee for the Fifth Brethren World Assembly included Jeff Bach, Church of the Brethren; Brenda Colijn, The Brethren Church; Milton Cook, Dunkard Brethren Church; Tom Julien, Fellowship of Grace Brethren Churches; Gary Kochheiser, Conservative Grace Brethren Churches, International; and Michael Miller, Old German Baptist Brethren Church—New Conference. The Brethren Heritage Center in Brookville, Ohio, hosted the conference. Robert S. Lehigh is president of the board of directors of the Brethren Encyclopedia Project, Inc., which sponsors and gives oversight to the Brethren World Assemblies, which are held every five years in various locations. The 2018 Assembly is tentatively scheduled for early August in Winona Lake, Indiana, the home of Grace College and Theological Seminary and the Fellowship of Grace Brethren Churches. ISBN for the book, which also includes a number of photographs from the 2013 assembly, is 978-0-936693-53-8. The retail price is $25 plus shipping and handling but the book is currently available through Brethren Encyclopedia channels for the discounted price of $16 plus $5 for shipping and handling from Brethren Encyclopedia, 10 South Broad Street, Lititz, PA 17543. The book is currently available for purchase on Amazon.com.